Are you looking for a domestic cleaning job in the United Kingdom? If so, did you know Maid2Clean has hundreds of offices around the country looking for professional domestic cleaners. The easiest way to find your local Maid2Clean office is to search for your nearest Maid2Clean office. To get started please type your postcode of town in to the box below and click the ‘Find My Cleaner’ button. Another way to search for domestic cleaning jobs is to use the Nationwide Cleaner Jobs website. 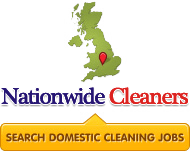 This website lists hundreds of domestic cleaning positions around the UK and you can even apply directly via the website. What makes Maid2Clean stand out from the crowd? Are you looking for a cleaning job? Visit our recruitment website, Nationwide Cleaner Jobs! Franchisee Head Office address can be found by entering the postcode on this page and scrolling to the bottom of the page.